Dog point socket set screws are set screws with a protruding tip along with a flat surface at the end opposite that of the hexagonal drive. Dog point socket set screws come equipped with half or full dog points and are intended for permanent setting. The point should fit closely to the diameter of the drilled hole or against the flat. 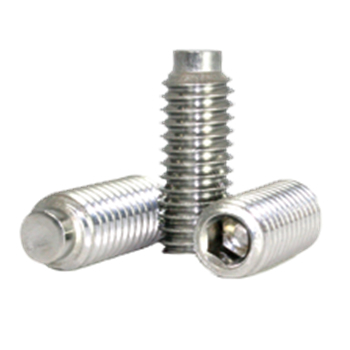 Dog point set screws are often used instead of a dowel pin. RC Fasteners & Components stocks dog point set screws in half and full dog points. Our half dog points are stocked in alloy black ox, 18-8 stainless in both metric and inch sizes. We also stock certain sizes with a nylon patch.